There are, roughly, twenty thousand different types of flowering plants in North America. 2. Non-natives: introduced and (successfully) established, sometimes invasive. 3. Cultivars: selected and grown by humans. Wildflowers are able to grow and thrive on their own, without any help. Generally native, wildflowers can also include (naturalized) non-native species. In this article we will focus on several key concepts about edible wildflower species. Spring and summer offer more than just a chance to go outside and appreciate the natural world around us. They also provide us with the opportunity to build an in-depth relationship with the various plant communities in our respective bioregions. No matter where you live, there are wildflowers to be found. While spring and summer are the prime seasons for identifying most wildflowers, others such as yarrow (Achillea millefolium) will be easy to spot during fall and winter. Basic wildflower identification begins with going outside and "hitting the trail". Equally important is having access to proper reference material. Although there are several digital resources available (e.g. the internet and smartphone application software), nothing beats a field guide. It is important to note that cross-referencing, using two or more field guides (or other reputable sources of information), is essential when it comes to being fully informed. - Go outside and bring reference material (e.g. local/regional field guides). - Bring a notepad and pencil in order to take detailed notes. - Bring several small paper bags, a "10 X" magnifying lens, and a pair of scissors. - Having a good camera is nice, especially when identifying wildflowers at a later date. - Identify using several defining characteristics, not just one. - Get a second opinion if you can. - Have fun during the identification process and remember to enjoy nature as a whole! 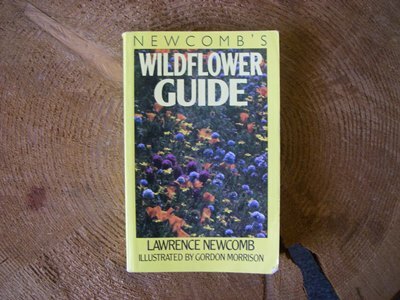 A great book to use when identifying wildflowers is Newcomb's Wildflower Guide (Lawrence Newcomb, 1977). Using a comprehensive key, this book will help you identify many North American wildflowers. Looking at specific characteristics of the particular plant you are trying to identify is another great way to help you determine what you are dealing with. - Where is it growing? - Which time of year are you spotting it? - What is the plant size? - What is the shape and color of the flower? - How many petals does each flower have? - What is the shape and color of the leaf? 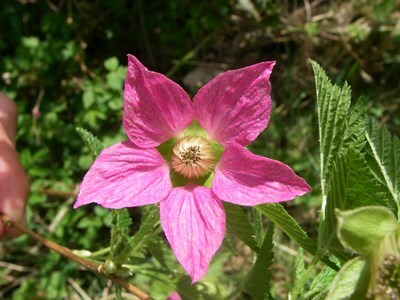 Using the steps mentioned above, in combination with the appropriate reference material, positive identification of almost any wildflower is possible. Harvesting wild plants for food, medicine, or other purposes is often called wildcrafting. 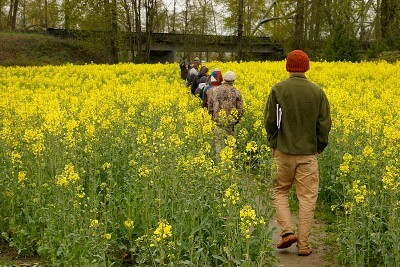 When harvesting plants we should see ourselves as stewards of the natural world. Just like leaving no trace after a camping trip. If we have become aware of a particularly interesting group of wildflowers in a specific area we should treat them as if they were in our own garden. This means that we would "tend" these wildflowers rather than just take all of them. If we try to harvest only one out of every twenty wildflowers (or none, if there are less than twenty) we can ensure they continue their natural cycles in full. Only taking what we need also gives other people a chance to enjoy them. Of course local wildlife populations rely on certain plants as a food source as well. - If there are many specimens available try and harvest only one out of every twenty. - If there are only a few specimens available enjoy them without harvesting anything. - Harvest no more than one third of the total plant. - Cut rather than tear. 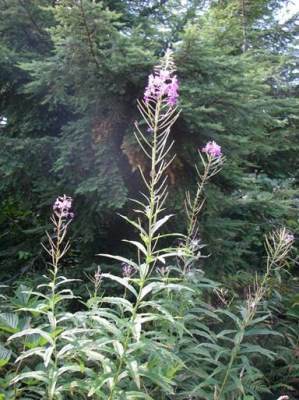 - Avoid those plants growing along roads or in parking lots. - Avoid areas that are actively sprayed with chemicals. - Positively identify and clean (e.g. insects and debris) your harvest while in the field. - Harvest the parts that look fresh and good. - Remember to harvest ethically. Location is everything. 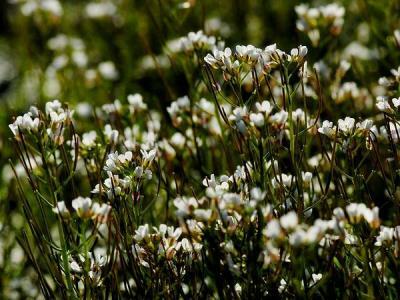 It is important to note that many edible and medicinal wildflowers (and plants in general) can be found close to home, in seemingly unlikely areas. For example, dandelions (Taraxacum officinale) love "disturbed" areas (e.g. along gravel roads, lawns, and forest trails). Others can be found along "edges" (e.g. where grass meets the treeline or along the edge of a river). Cities often harbor wonderful pockets of plant diversity. Finding these interesting areas is half the fun! 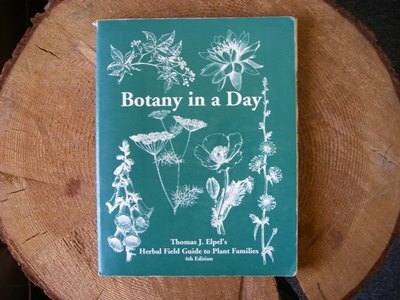 Another helpful book when it comes to harvesting and identifying edible wildflowers is Botany in a Day (Thomas J. Elpel, 2000). Besides in-depth information about plant identification this book also covers appropriate harvesting techniques. Many edible wildflowers also have some medicinal qualities. It is important to note that while many wildflowers are edible they will not all be a palatable as you might like them to be. Of course we do not always have a choice, especially if you find yourself in a survival scenario. - White and red clover (Trifolium repens and Trifolium pratense). - Pineapple weed (Matricaria discoidea). - Milk thistle (Silybum marianum). If you are not completely sure which plant you are working with do not eat it. When you have positively identified a particular plant please make sure you consult your reference material. Every plant is different and there is always a correct way to harvest, prepare, and consume (or use, when it comes to plant medicine). Building a working relationship (i.e. observing, studying, and using) with plants you encounter throughout the year is desirable when it comes to understanding them completely. None of the information provided in this article should be taken as medical advice, nor should you assume that just because a plant is edible there will be no potential allergic reactions. Rubbing a small piece of an edible (but new to you) plant on the skin of your forearm and waiting for five to thirty minutes can (but this is not definitive!) indicate whether or not you are allergic to it. In the hospital setting these tests often involve puncturing the skin. It is not recommended that you go this far. As a general rule when dealing with new wild foods you should try a tiny (quarter inch squared) piece and wait for about thirty minutes to see if your body reacts adversely. If you do not have an allergic reaction it is still a good practice to consume wild edibles in moderation (some can be harmful in larges doses). Caution is the key word when it comes to wild edibles. This goes hand in hand with being fully informed. For example, mullein (Verbascum thapsus) is listed above as an edible wildflower. 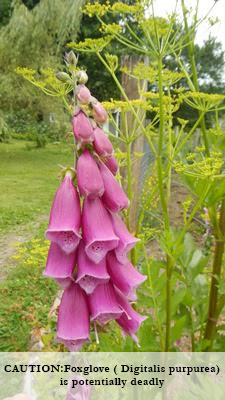 However, foxglove (Digitalis purpurea) is a look-alike that is potentially deadly. If you are not completely sure which plant you are working with do not eat it. When you have positively identified a particular plant please make sure you consult your reference material. Every plant is different and there is always a correct way to harvest and consume (or use, when it comes to plant medicine). Many edible plants have different parts (e.g. flowers, stems, and roots) that can or cannot be consumed. Make sure you know what parts to work with and how to prepare them. Now it is time to go out and see if you can find the edible wildflowers listed above (and more!). 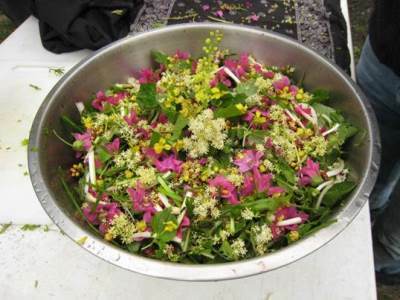 Please consult our other articles on specific edible and medicinal plants for more information on this topic and/or attend a wild edible plants course. Newcomb, L. (1977). Newcomb's Wildflower Guide. New York, NY: Little, Brown and Company Hachette Book Group USA. Elpel, T.J. (2000). Botany in a Day. Pony, MT: HOPS Press. Pojar, J., & MacKinnon, A. (1994). Plants of the Pacific Northwest Coast. Lone Pine Publishing. Kallas, J. (2010). 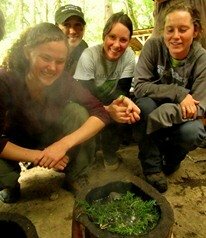 Edible Wild Plants, Wild Foods From Dirt to Plate. Layton, UT: Gibbs Smith. About the Author: Bernard van der Weerdt is an experienced bushcraft instructor. He formerly taught at Alderleaf. Learn more about Bernard van der Weerdt.